#simplescrapper + #paperissues layout share! I just wanted to pop in really quick to share a layout I created this week using the sketch challenge over at Paper Issues, sponsored by Simple Scrapper! Welcome to Paper Issues Um Wow we love chipboard! You should have arrived here from Corri's blog! If this is your first stop, be sure to head over to Paper Issues to start at the beginning! So I created a layout (yay!) featuring a lot of Elle's Studio (that I got at Paper Issues!) and some fabulous flair and chipboard from UmWow Studio! I've been really into using flair and chipboard/wood veneers in my scrapbook layouts lately so this "issue" has been really fun for me! I also used some new developed pics from Persnickety Prints - I'm loving their 3x4 Polaroid option! Here's a little video about my layout! Anyway, next up on the hop is Leah! Link up your projects using any Um Wow Studio or some chipboard to the Paper Issues blog! Hope you get a chance to play! Have a fabulous week! 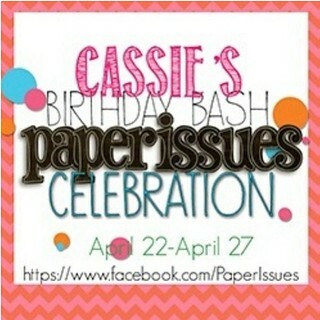 Paper Issues Lifestyle Crafts Blog Hop! Welcome to Paper Issues “Lifestyles to “die” for"! You should have arrived here from Jess's blog! So my project today is really super simple. With three kids under the age of 6, I really don't have enough time in the day to create complex projects! I needed to create a quick card for a friend who's feeling low so I used one of the dies to create an accent piece for the sentiment from SOG. And I had some extra bits left over so I made a few 3x4 Project Life filler cards using more dies and a few more stamps! Easy peasy! Anyway, next up on the hop is Kristy herself, from Some Odd Girl! And don't forget to use my coupon code when shopping at Paper Issues! DT Intro over at Paper Issues! Also don't forget to use my code JOBOOGIE to shop at 20%! Go to the Paper Issues store HERE! I can hardly believe it! I'm super excited to be sharing with you more scrapbooking layouts and projects - because we all know, that I really need to do more of that! And be sure to check out Paper Issues on Facebook for a FUN week ahead! Oh and by the way? I have a COUPON CODE for you! Use it anytime during my term with Paper Issues! Why? Because I love y'all like that! :) Go HERE to shop!